Linda Abraham: How many people do you recommend trying to connect with at UCLA, in terms of recent students, alumni, professors, etc., before applying? Lindsay Haselton: We do get asked that question a lot, and I think it is great to be able to get a feel of the culture of the school that you’re entering or planning on applying to; so we do provide a number of different ways that you can do that. I think most commonly, first of all, would be an event. So we host a lot of events on campus and off campus where we have alums and current students hosting information sessions or sitting on panels, and they’re a really good chance to be able to ask questions about what it was like actually going through the student experience…The other way is by reaching out to our student clubs, and I know Adrian had told you a little bit about the leadership opportunities that you will have in the program. We have 45-plus different clubs—so what applicants often do is they will go to our website. We have a list of all of the different clubs, and you can email the leaders in those clubs and ask them questions that are relevant to their career interests, or perhaps, just hobbies on the side…. Adrian Aguirre: And if I could add just an extra thought. I want to make sure folks don’t misunderstand the reason why this is important. We’re not keeping track or scoring you for how many alums or students or faculty you have contacted. But it will definitely have an impact on the quality of your application, particularly in your essays for example, because the more informed you are and the more grounded your plan for the future is, the better it’s going to be perceived, and we think the more you’re going to be excited and enthused about the whole process. So it’s not so much for our sake; it’s really for you as an applicant to do part of your due diligence and to realize if this is the right school for you, what are some of the reasons that you feel that way…. 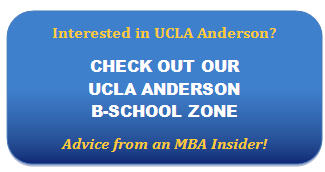 Please view the full transcript or listen to the audio file here and see our UCLA Anderson B-School Zone for more advice on how to create the most impressive UCLA Anderson application.